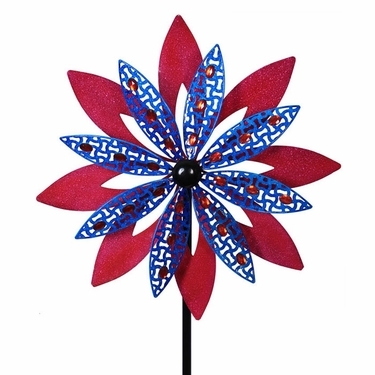 Spin motion and patriotic fun directly into your flower garden with the youthful charm of our new 75" Giant Patriotic Pink & Blue Wind Spinner! All metal in design, constructed with stainless-steel ball bearings ensuring that even those warm, calm summer breezes will spin this vibrant metallic painted flower of magenta pink, white and blue. Firm 4-prong pitch stake bottom for extra stability, so it can blow you away without being blown away itself. Size: 7" x 24" x 75"H, Resin.